So with all the background taken care of we can now give Flintlocks & Tomahawks a go. In this scenario we’re pitting a Pawtucket Indian tribe against a New England Independent Company, predominantly made up of Christian Indians. As with all Muskets & Tomahawks games neither side knows who’s going to be the attacker or defender. However, as mentioned in the previous post, the way scenarios are generated creates sensible game set-ups for both sides and so it was for this one. In this case an New England Independent Company was deemed to be the attacker given a Slaughter scenario. The Pawtucket Indians were given a Scouting mission scenario which entailed them moving across the table, scouting out of each sector as they went, then retreating back off table from whence they came. Forces for this particular scenario with fairly simple. This in part was due to the figure mix that we had available. I’ve yet to acquire appropriate forces for the New Englanders, though I have settled on the figure mix having got all my samples sorted out. This provided less contrast between the forces involved but still produced an interesting clash. Pawtucket Indians: all armed with flintlock muskets. Massachusetts Independent Company (Rangers): combined Christian Indians and Rangers all armed with flintlock muskets. Looking at the table below the left side was the entry edge for the Pawtucket Indian force and the right side the Independent Company force. As objectives are known before game start, each player can plan accordingly. His sub plot however was unknown. The Independent Company rangers and indians need to set the village on fire as well as deny the opposing Indian side their scouting mission objective; for the Indians the opposite is true..obviously! This scenario combination invariably sets up both sides the option to either deny their opponent his objective and/or achieve their own. In this case, it would entail both forces having to move forward aggressively at some point, setting up a confrontation. In addition to these objectives side plots would come into play to determine victory. The small Indian settlement known as Prickly Pines nestles next to the Merrimac River in a clearing, in upstate Massachusetts Bay. Whilst some cover exists, many open areas remain, aiding the settlement’s crop planting, but making it slightly vulnerable to attack, its location being generally accepted as traditionally difficult to reach by colonist – a raiding independent company however is about to try and change all that. Initial deployment by the Rangers sees them represented by the small wooden disks on table – as they have the Scout trait they may deploy on hidden markers. The Pawtucket Indian forces, when activated, come on from the opposite table edge. An event card is drawn and a piece of dense brush is placed on table near the edge of the village near the wood. Like a thunderclap, the Pawtucket warriors burst onto the field attempting to scout out the area and temporarily secure the village. A succession of card draws gave the Indians a good run of cards to enable them to seize an advanced position. More Pawtuckets move quickly, pushing up in centre field…this is looking like a sunday afternoon stroll. Whilst the initial advantageous Pawtucket Indian successive move was useful, there invariably is an opposing response. The Independent Company commander, realising he needed to press on toward the village to put the torch to it, ‘comes off’ his hidden markers and urges his men up to the village…the fight is on! With the move to contact made, the company commander sets up a firebase of musketry in the central wood. He hopes to deny the Indians an ability to scout out the sectors of the field whilst providing fires support for his warriors, sent helter-skelter toward toward the village…firebrands lit! Now the Independent Company gets a good run of cards; they are able to bring effective fire on enemy before they can respond…the Ranger line opens a brisk fire. The left flank is held by a small band of warriors nestled in the rocks…good ground! This shot shows the exposed position of the Pawtucket scouting party, now in clear view of the Christian Indians in rocks opposite them. In the woods to the left the Pawtuckets still have some unrevealed troops (seen by the wooden disks), though they could be ‘dummies’. The next card draw proves devastating to the (near pic) indians in the open. They suffer three dead out of six; the unit breaks and runs from the field…another unit is tentatively holding on in the middle ground having lost two dead but passing their reaction test. …meanwhile a steady volley continues to ping away from the safety of the treeline. This firing has been somewhat desultory but the odd casualty has been suffered by the Pawtuckets nevertheless. A wide shot – the action has mainly been concentrated in the village. The attempt to scout out the field has proved a failure and the Pawtucket leader now sees that pressing on to do so will only result in dead braves, little more. Frustratingly, the central small band of warriors has been driven back by an adverse reaction test and now is unable to scout out the ‘right-side’ sector of the table. The first hut is a burnin’! The second also has been set alight. Note – in Muskets and Tomahawks, setting buildings on fire, etc are core elements of the game so they are handled in a simple ‘task based’ system…nice an easy. Essentially units have to forgo other activities like firing and reloading, whilst they conduct tasks like setting buildings on fire, etc. …emboldened, the Christian Indians advance across the centre field, not realising that the opposing woods still have enemy hidden markers!! A close fight now develops. The Christian Indians continue to set fire to the log-house whilst engaging in a exchange of fire with the Pawtuckets who had moved back toward the dense cover near the village. In the wood near the river the Pawtuckets bring effective fire against some Christian Indians and force them to recoil. The battle takes a turn – in the near ground the Pawtucket braves in the woods deliver yet more effective fire against the attacking Christian Indians. Whilst two of three huts are alight the defensive fire is starting to take effect. Pawtuckets in the brush…the chief has the red robe over his shoulder…what are they up to? In the village the Christian Indians have successfully torched two out of the three huts needed for victory…they are weakened however. In centre field, one unit of Christian indians is forced to flee from the casualties suffered from the fire from the wooded treeline. The supporting group however presses further into the wood…a close range firefight now develops. One group of Christian indians takes refuge in the nearby wood. A volley opens up in the village from the Pawtuckets defending the village in the dense brush…the contest for the centre field wood continues. Pawtucket Indians vs Christian Indians. In what turns out to be a ‘death charge’, the Pawtuckets lose the combat and are eliminated..their chief included…whilst the third building is now set alight…it looks like curtains for the brave Pawtucket warriors. Sensing victory the Christian Indians abandon their position and advance from the centre wood toward the village to offer support. Delivering the coup de grace, the clash in the centre wood (left-side) results in a failed reaction test for the Pawtuckets and they run from the field. The company commander, some men in tow, then exit the field after them in hot pursuit. …yet another indian village suffers the fate of so many others in the devastating conflict, that is King Philip’s War. An excellent game that played in about two and a half hours with about thirty minute setup. The forces were 500 points and the scenario system was straight out of the book. Terrain was generated in the usual method as was the selection of table sides. So all in all it was pretty stock standard Muskets & Tomahawks. We determine victory a little differently to the standard game – our house rule. We give 4 point to the side that gets its main objective, and 2 points for a successful subplot. If you score 4 points difference then it is a tactical victory, if you get 6 points difference it is a major victory. This somewhat lessens the effect of the sub plot but still makes it important. In this game the Independent Company achieved its main objective whilst denying its opponent theirs – 4 points. The subplot required the Independent Company to have an officer leave the opposing table edge, which he achieved (after the firefight in the wood). The Pawtucket sub plot was for the chief to die in battle – which he did in the last attack in the village so 2 points for the Indians…that’s what he was up to! Therefore, the final score was 8-2 = 6 points to the Independent Company…a decisive win for the Colonists! By looking at the table, I think it is fair to say that is what happened. The clash itself involved two Indian forces. Essentially it was a Ranger force vs an Indian force which was a total clash of Irregulars. Whilst this is certainly not uncommon in King Philip’s war it’s not typical of most actions throughout the conflict. A better representation of the period would’ve had the Pawtucket Indians fighting off a Colonist force that would’ve been made up of forces more conventional, who may have had some support from some Rangers and/or Christian Indians. Nevertheless, this is a perfectly reasonable clash that you can expect from games in this setting…and an enjoyable game it was to. There weren’t any significant differences from the standard game so this in many respects played out much as it would have done in the French Indian Wars. The troop type profiles worked very well and reflect their real life counterparts. As I said, we were limited to a certain degree by the forces that we had available; once forces are amassed then we’ll be able to engage in more typical actions of the period to bring out its unique elements. That said, this game was fine just as it was. It would be perfectly reasonable to play Musket Tomahawks in the King Philip’s War setting and nothing else. There are plenty of moving parts and interesting differences that make the period by itself very enjoyable. By way of extension the soon to be fought King William’s War only a decade or so later can be considered a continuation of similar types of conflict, but in that case the introduction of French forces and English Colonial Militia gives the game a feel more akin to the later French and Indians War conflict, but not quite. By the time of Queen Anne’s War you have British and French regular forces fighting one another portending the struggle for North America between the two empires. 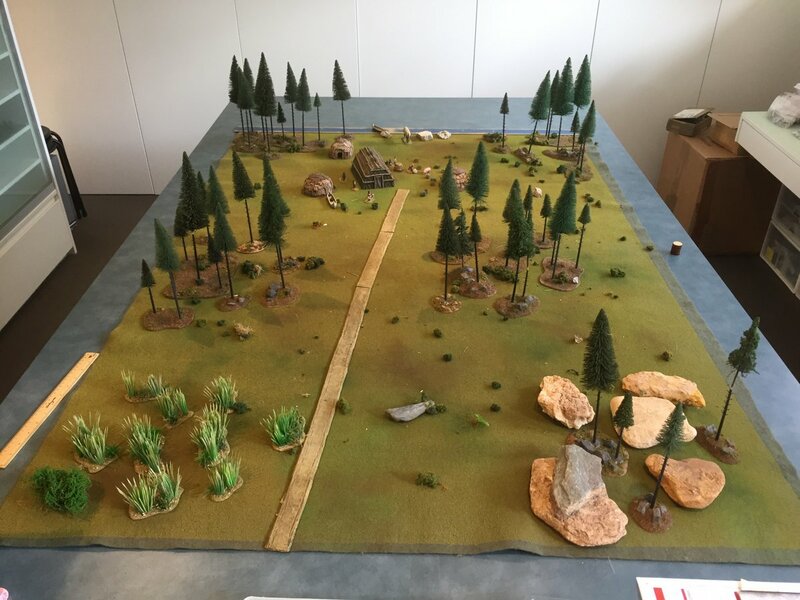 There really is a huge amount of potential for gaming the conflicts leading up to the ‘main game’ of the French and Indian Wars in the mid eighteenth century and Studio Tomahawk’s Musket & Tomahawks system can handle them all.